“Deformity in nature is accidental, Man chiefly contributes toward producing it in landscape. If the earth was not infinitely too vast for his conceits the form of it would be spoiled ages ago by his tastelessness and foolish operations. It is as well that all he can possibly do amounts to no more than scratching the mighty globe with a pin. 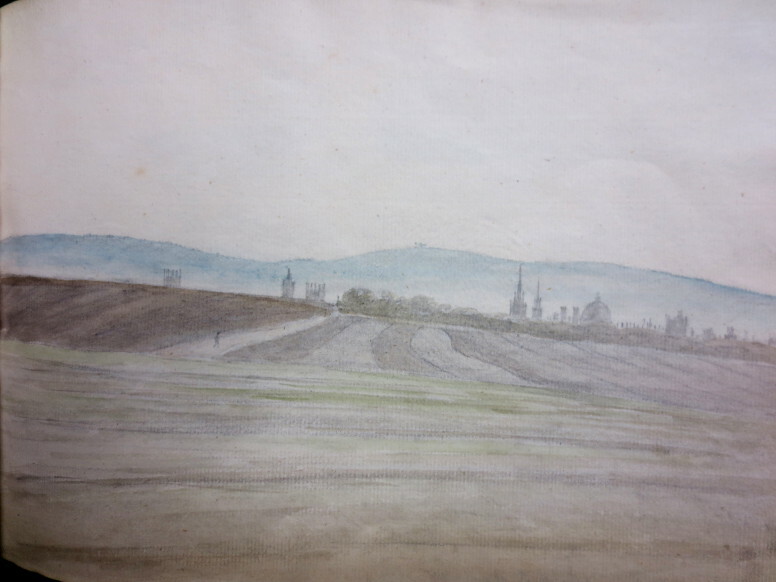 They are valuable both as early examples of British landscape drawing, and as the earliest known views of Headington and other villages on the cusp of major change. The images used are under copyright and may NOT be reproduced without permission of the copyright holders identified in the captions. His work is welcome relief from the conga line of Radcliffe Camera’s, Christchurch Cathedrals and unending stream of tired colleges the researcher is fated to endure. By 1798, Malchair was in failing health and gradually going blind, but it appears Crotch and other pupils continued the tradition. In the mid to late eighteenth century Headington was a small, poor rural village poorly connected to Oxford via muddy tracks and footpaths on the cusp of major change. Within a few short years, the impact of the industrial revolution, population growth and the accompanying social changes would sweep much away. The opening of the Stokenchurch turnpike over Headington Hill (London Road) in 1775 (Bloxham 1996 p.63) suddenly rendered Headington a desirable and accessible location away from the growing pollution of the city below. The “Champion” medieval landscape of the last open common fields that had existed before the Norman Conquest, were to be enclosed by 1809 Enclosure Award, finally laying to rest the Manor of Headington as an entity that had endured, in one form or another, for approximately a 1000 years, transformed the landscape from common land to private freehold property and determining legal rights of way. At a stroke, the fortunate few that became freeholders and, within a short time after, the housing of the great Victorian era would appear. 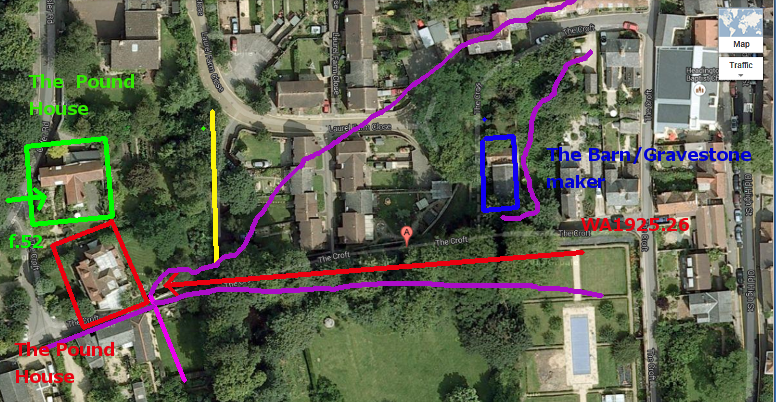 The “Headington Villas” of the Rookery, Headington House, and Bury Knowle House would shortly be built, largely by the nouveaux riches of the new order, sequestering common land behind high walls, (Walker 2007)even so far as to deny mourners from Headington Quarry access to St Andrews Church. Regardless of the moral dimension, clarity of landownership and of rights of way permitted capital investment and growth. The Malchair style and influence is clear. 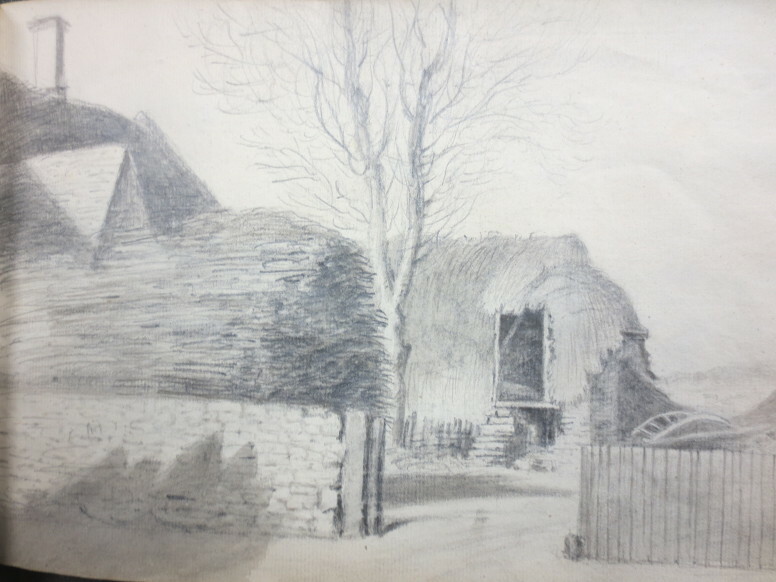 Unusually, and most refreshingly , rather than concentrating on the church and the village core, the sketches are of ordinary things, Mr Pearson’s, “Little Blenheim,” barns, ponds, and of course, Headington’s leitmotif, walls. We see a poor rural community of thatched cottages, with raised footways above muddy lanes with some early larger houses, early examples of the villas of Headington. The works by an unknown artist (c475 except f.95) [fn3] appear to be copies of work done in 1798/99, possibly by Crotch, the copyist visiting each scene between 1803 and 1806. Some maps below have an underlay of the first 1876 OS map with google images map superimposed which not exact, mainly due to fisheye lens distortion. I have indicated where some of drawings may have been, with varying degrees of certainty. Many images are “galleries” click on the first image and click on the large arrows that should appear to the left and right of the image to go to the next. It may take some seconds to load. Press escape to exit or click the top left X on the screen. View full size by clicking again, or view full size on right bottom. Resolution is low to speed loading. Where useful, sketches are presented in picture only, page, and photo of current location. In WA1925.26, “A View Of Headington”, the sun is shown at 60 degrees on the 19 May 1773, so it is midday as the maximum elevation that day was approximately 58 degrees, therefore the observer is looking to the NWW or 285 degrees, with the tree shadows pointing due north. In the foreground to the right is a work shed with a gravestone and chopped logs immediately in front of the viewer. This may be on the site of Croft Hall where gravestones are embedded in the wall. A lady walks along the path that will become approximately the E-W branch of The Croft, while a couple with a dog walk along a track leading to the village core. A stone wall (YELLOW?) in front runs across the picture in the rear, due north/south, slightly falling down the hill. There is a strong suggestion of a lane between the wall and houses across the picture (rear) continuing to a tether point just visible to the left of the leftmost of the pair of trees in the foreground, possibly an early version of Osler Road further east, to the Britannia. Between the “The Court” and “Pound House” it appears land falls away down Headington Hill with trees below in the far background. Roofs at low level suggests land falling away to the extreme left rear of the picture, which is difficult to reconcile with land at this point, however this may be an agricultural shelter or cool house of some sort. However, the dual, but not matching external chimney stacks, (both now and on the watercolour, and identified as C17 in the HER see appendix), the sloping and tamed nature of the landscape, the gravestones near the church, the paths running where people would need to go, and the exactly correct orientation to the sun and houses to each other can leave no other room for doubt. Both The Court and The Pound House have been very extensively remodelled, but the chimney stacks of the former (which dictate the slightly asymmetrical pots) are C17 – the T shape of The Pound House may be a survival of its original shape, even if relocated westwards. The three bedroom “stone built” cottage at “The Court” prior to the current incarnation is shown in a bill of sale from 1914 with the chimney stacks covered, but are the same. It appears the current form was a mostly successful attempt to bring it back to its original form. Around the edge of the village (The JR) there is good tree cover, possibly survivals of the ancient royal forest of Shotover. 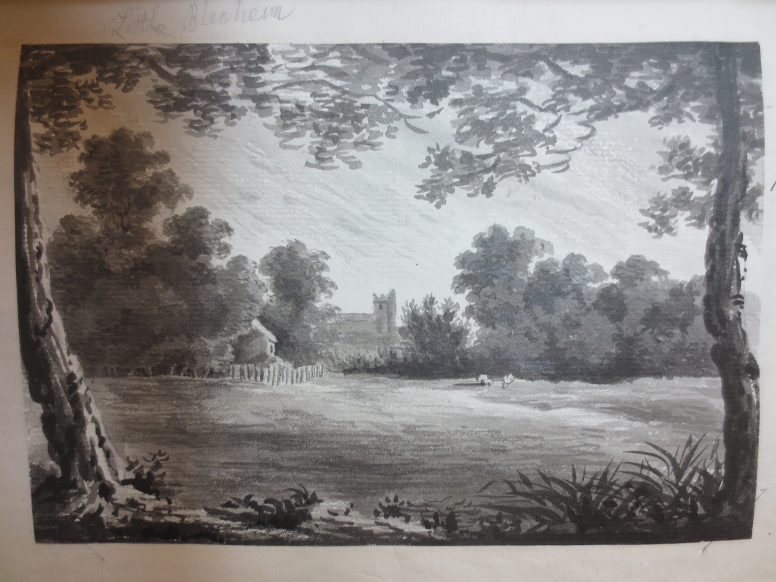 Within a few years, this landscape would be transformed from a surprisingly clear green sward to the high walls of Headington House (1775, William Jackson of Jackson’s Oxford Journal) to the left following enclosure, and Laurel Farm Close to the right. In c475_f.52 a very large house stands with a receding stone wall on what appears to be either the beginnings of a junction to the right, or a widening of the road. Past the house to the left, the road appears to swing rightwards, or it is a field. No building of this distinctive shape appears on the enclosure map of 1805. This may be also “The Pound House” from the west/modern Osler Road side, with the widening representing the modern Croft running past “The Court.” The Pound House has been extensively remodelled, redesigned, and very possibly relocated – measurements would place it slightly east of its current position. Two other possible locations are across present day Laurel Close to the east of St Andrew’s House, or Mather’s barn and/or farmhouse. 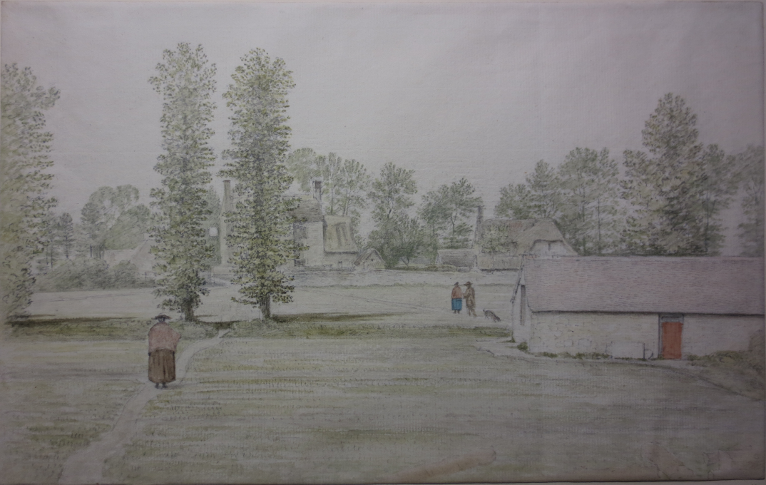 Crotch apparently (the dates do not match the ONDB biography well) produced one watercolour of Headington in 1832 from “J. Locke’s Terrace” on the site of modern Emden House – implying strongly that Bury Knowle House grounds reached as far back as the top of the current wall to Barton Lane, and the modern Mather’s Farm barn has been rebuilt since. This appears to show a house similar to that of c475_f.52. c475f.65 shows a building with a lane going steeply down the hill, with the suggestion of a small courtyard on top of a wall, with a lane going left and a green to the right. This would appear to show the farm that was on the junction of Osler Road and St Andrews Lane. c475f.66 is currently unknown – a flat, wide track narrows and appears to meet a junction to the right. 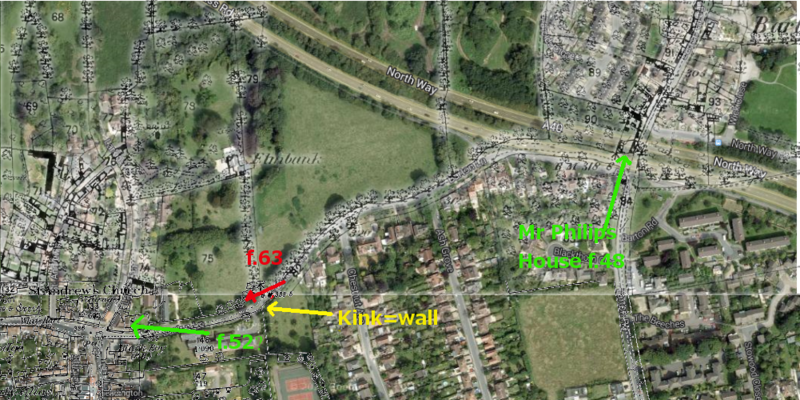 The wall (c475_f.63) at the entrance to Headington via Barton Lane, although rebuilt, can be exactly matched to the wall line of Emden House and the kink in the 1876 map as shown. The frequent reports of fires need no further explanation. We know little of Mr Pearson, other than he was not a beneficiary of enclosure as “Little Blenheim” was already enclosed as part of the village marked as pink on the 1805 Enclosure Map, and his name does not appear in the Enclosure Award. His house can be closely located as shown approximately where Stoke House is today, due to views of St Andrew’s church (as it was in 1800) [fn4] (c475_f.10), the tracks marked on the 1876 map which correspond approximately to those on c475_f.10, and one building set back from Stoke Place on a hedge with a hedge line to the north on the 1805 enclosure map. Aerial images show possible footings near to this site. The view in c475_f.10 is now lost due to housing on the east side of Stoke Place, but a similar view exists from the field immediately to the east. The cottage, described as north and adjacent to the house, is not shown on the west view in c475_f.11, as it must have been deep in the copse behind. In c475_f.12, a man with a hat stands outside a house while two others push a wheelbarrow. There are some houses in Barton in the far distance. c475_f.88 (not shown) is another view of the church to the east of f.10 described as “from the cottage” the back of which is shown in c475_f.34 below. In c475_f.29 and f.30 (not shown), the side of barn is shown going to a house with two chimneys with the Bayswater Brook treeline and Elsfield in the distance. This is locatable by two structures linked by a wall on the 1876 map as shown. The c475_f95a colour painting is signed “WC” for William Crotch, f95b is a faithful, but not exact, copy, that may assist in determining if all the drawings are copies of works by Crotch. 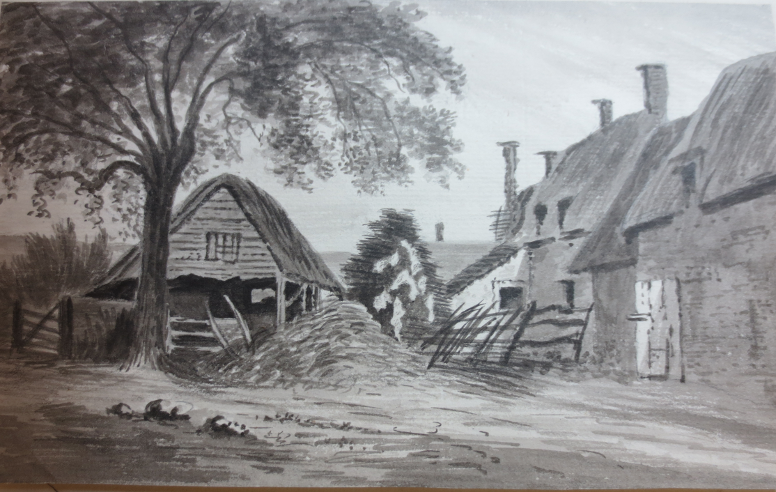 The sun rises in the summer morning of Aug 1st of 1799, slightly north of east casting a long shadow behind a lone worker whose house may be in the foreground. This appears to be stunningly powerful visual metaphor of the industrial revolution. The supposed new dawn seems to cast menacing long shadows on a shattered, stark and lifeless landscape below. The worker, cast to one side, yet toiling from the earliest hours, is looked down by the rich, sunlit house and idle spectator above – his shadowy house at the base of a pit, contrasting strongly with the well appointed one above, dominating, superior and unattainable. The young Crotch received his Doctorate in Music from Oxford University in this year. 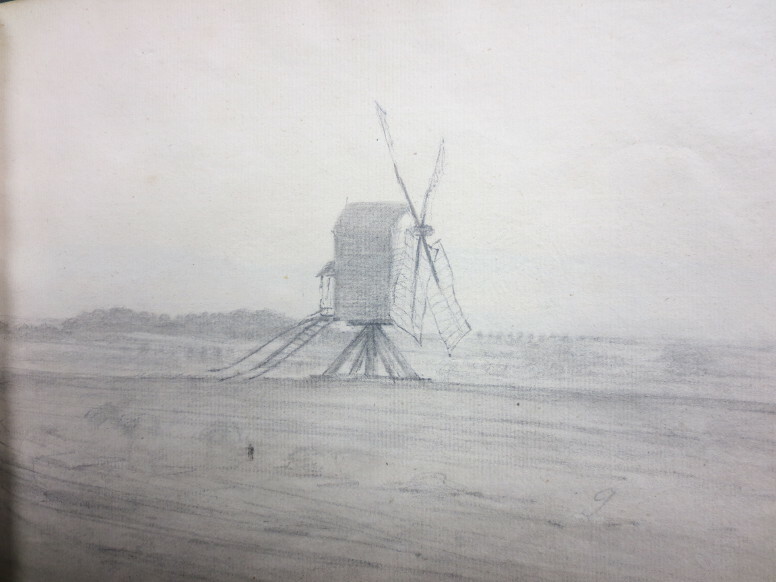 In v443_f13 a very large windmill, as evinced by the size of the sower in the foreground , “near Heddington” stands in fields with a low wooded, dual peaked hill behind to the left, possibly Shotover, near Windmill Lane. V443_f14 shows probably Cuckoo Lane with a man walking going to Joe Pullen’s tree where it intersects with a predecessor of Pullen’s Lane at a wayside cross (? ), at an angle less than 90 degrees as it does today. The observer looks from a point north of Cuckoo Lane on rougher, higher ground onto a ploughed field towards Oxford (NWW) rising out of the mist. To the left of the lane in the distance, higher ground veers off to the left (probably the reservoir area), except for a nearer part which appears to drop, it appears a track runs between the higher ground in the foreground, joining the track to Oxford. The brow of Headington Hill runs either along Cuckoo Lane or the modern London Road, except for the Headington Hill area just before it descends to Oxford, so this is most probably north of Woodlands Road, looking NWW towards Oxford along Cuckoo Lane, it is less likely to be the road prior to the turnpike (1775) which followed approximately the same route as London Road today, due to land rising south. This may be a view of the very last years of the “Champion” or strip farming method where each copyholder had a strip of land, which still endured in the Midlands at this date, from a large open field (Brockalles Field) (Evans 1928, p1) of the Manor of Headington in its very final years at the very dawn of English landscape painting – if this is the case it is a rare intersection – or it could be simply a ploughed field. The vista of Oxford is simply impossible, and in reality mostly invisible, therefore, other than the general due west view (note St Mary’s/All Soul’s College/Radcliffe Camera S-N alignment) it should not be taken literally. The other images are various views of footpaths wending their way down towards Oxford. Joe Pullens Tree was located in Pullens Lane at the junction of now Cuckoo Lane at the top of Headington Hill. Included mainly for its artistic merit and unusual treatment. WA1925.51, ‘Oxford from Shotover Hill, from Recollection‘, by Malchair, shows the old London Road wending its way down Shotover Hill to Oxford, with a flooded Isis shimmering to the left. We cannot arrogate Headington to the birthplace of Romanticism or Impressionism, that said, it was the scene of one of many early green shoots of a movement away from painting the great and glorious to fine observation of the God of little things, popularised by Constable some years later via a direct line of artistic succession from Malchair and Crotch. Malchair, Crotch and the Oxford School of artists did much to save Old Oxford and its surrounding villages in our memory, prior to impending destruction – an act we as a community should honour – but as with Antony Wood, Herbert Hurst, Henry Taunt and other greats who spent a lifetime preserving Oxford’s heritage at least in memory, they rest all but forgotten by a city that destroys its past and blights its future. Follow me on Twitter at : @headingheritage. Born in Cologne, Malchair disembarrassed himself of his German name of Johann Baptiste Malscher, he is quite correctly listed as an English artist. However his pictures frequently appear in tourist literature, the Ashmolean held and exhibition in 1998. Crotch,( W.) “Drawings of Oxford by him 1807 (?) 1803-1808”. The size of the church is incorrectly marked on my location map – it was bigger – see article on Medieval Murals. The author has no academic status or qualifications in history and no other help has been received, therefore all misinterpretations and erroneous conclusions remain his alone. Clearly, this help does not imply endorsement of either the article or content of the Headington Heritage web site. Also thanks to Museum of English Rural Life, Reading for answering positively the question whether the view of Headington Hill could actually be the Champion system at this late date. In particular, a staff member of the Print Room at the Ashmolean for her great help, especially for introducing me to Malchair’s book of instructions in his own hand. Due to prohibitive licencing costs I am unable to show images owned by Oxfordshire History Centre, in particular the Enclosure Award Map which is regrettable. All images presented here were independently researched and sourced. BLOXHAM, C.G., 1948-, 1996. The changing faces of Headington. Witney: Witney : Robert Boyd Publications. CROTCH, W., 1775-1847, 1964. 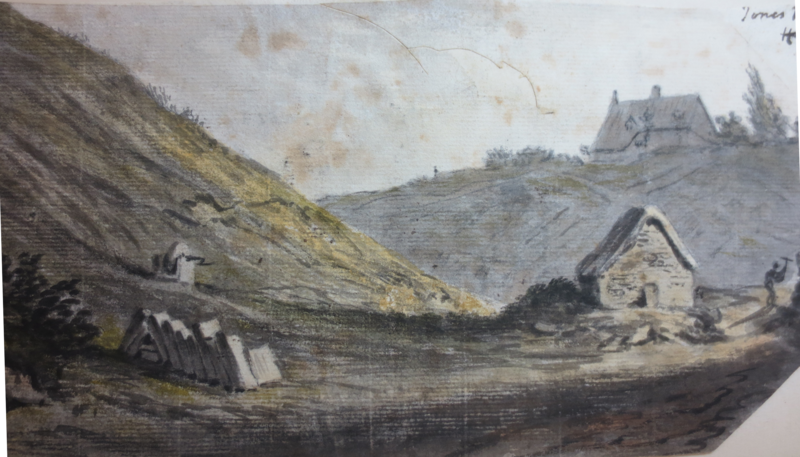 Exhibition of fifty drawings & watercolours by Dr William Crotch 1775-1847 : held at] Charterhouse Studio 1964. S.l. : S.l. : s.n. EVANS, E., 1928. The manor of Headington. Shipston-on-Stour: Shipston-on-Stour : the Kings Stone Press. HARRISON, COLIN, WOLLENBERG, SUSAN and MUNBY, J., 1998. John Malchair of Oxford : artist and musician. Ashmolean Museum. HEALEY, T.B., Oct 2006. Malchair, John (bap. 1730, d. 1812). Oxford Dictionary of National Biography, (22 Nov 2013), pp. [http://ezproxy.ouls.ox.ac.uk:2117/view/article/56011, accessed 22 Nov 2013]. MALCHAIR, J., 1791. 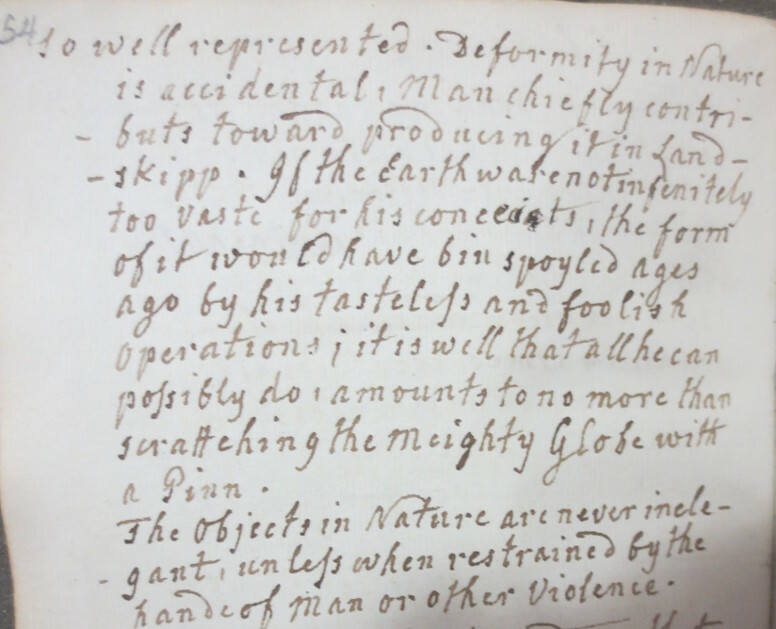 Observations on Landskipp, with many and varied examples, intended for the use of beginners, IAshmolean Print Room). MINN, H., 1943. Drawings by J. B. Malchair in Corpus Christi College. Oxoniensia, 8, pp. 159–68. OPPÉ, P., 1943. John Baptist Malchair of Oxford. Burlington Magazine, , pp. 191-197. ROPEIK, R. and COUCH, P., , Constable’s The Hay Wain [Homepage of Khan Academy], [Online]. Available: http://smarthistory.khanacademy.org/constables-the-hay-wain.html2013]. WALKER, R., 2007. Bury Knowle House in Context: its History, Design, and Architecture. Oxoniensia, , pp. 27. “Reviving Landscape Painting Studying the English painter John Constable is helpful in understanding the changing meaning of nature during the industrial revolution. He is, in fact, largely responsible for reviving the importance of landscape painting in the 19th century. A key event, when it is remembered that landscape would become the primary subject of the Impressionists later in the century. C.475 – Unknown artist(s) except f.95 by William Crotch. [fn3], possible copies of Malchair or Crotch. f.88 N.E. Side of Heddington Church ..
All by Malchair, except WA2004 by Crotch. Magdalen College as a set of twelve Malchair images, one of which is marked Headington? but is of little value.